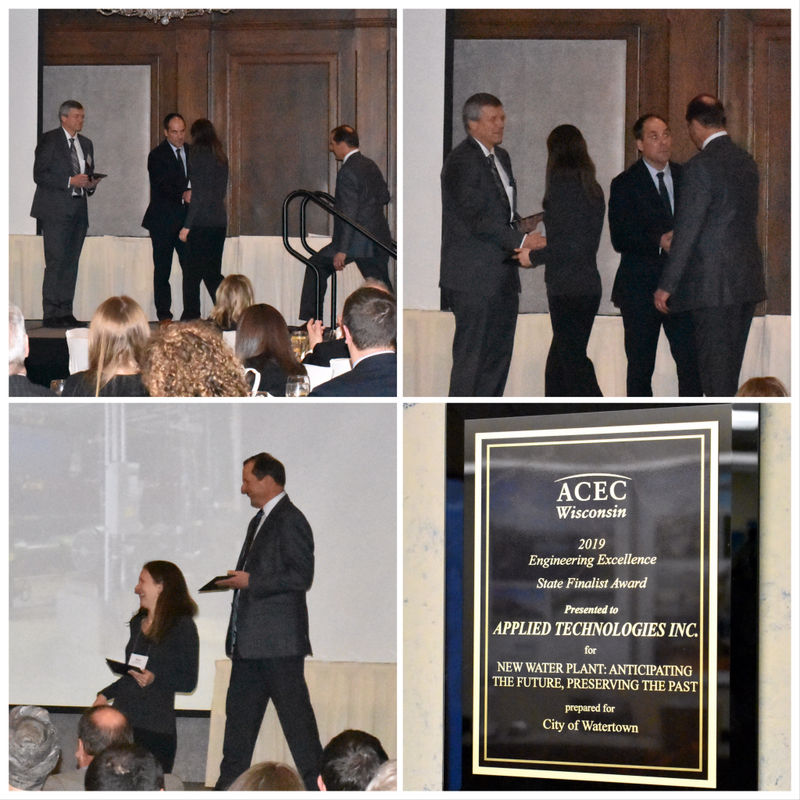 The American Council of Engineering Companies of Wisconsin (ACEC WI) presented the 2019 Engineering Excellence State Finalist Award to Applied Technologies Inc. (ATI) for our historic Water Treatment Plant project for the City of Watertown. 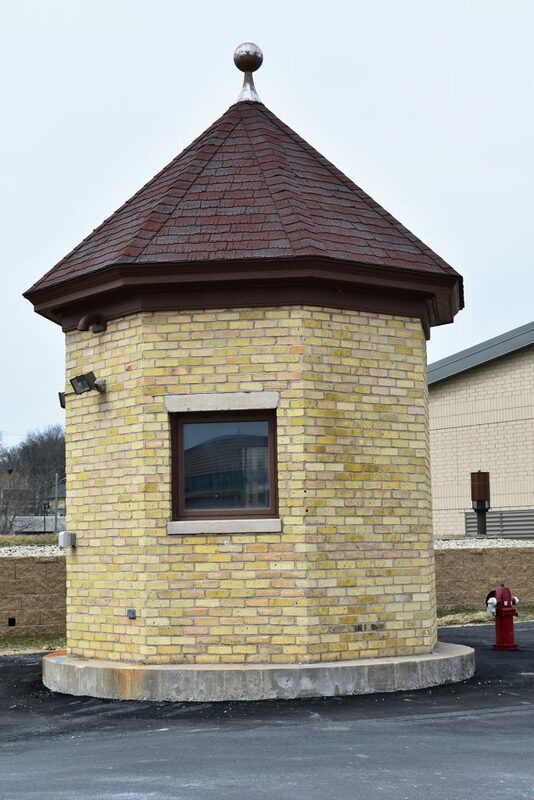 According to the judges, the submission, titled “New Water Treatment Plant: Preparing for the Future, Preserving the Past,” was selected because it “exemplifies the skill and creativity of the engineering discipline.” The project team accepted the award on Friday, March 22, 2019 at ACEC WI’s Award Banquet in Kohler, WI. The City of Watertown supplies water to 24,000 Jefferson and Dodge County residents. The Central Water Treatment Plant (WTP) had been an integral part of the City’s water infrastructure for over 120 years, treating half of the City’s water supply. Its historic Well No. 1 and Water Department building were constructed with the brick and rubble from an old Rock River mill in 1896. Upgrades were made throughout the ensuing decades to add iron removal filters and increase filtration capacity. Though the City took great care in maintaining and upgrading its water infrastructure, time had taken its toll on the Central WTP. The facilities were in poor condition, energy inefficient, insufficient to meet operational needs, and violated various current code requirements. In addition, the plant was incapable of meeting the projected year 2035 population water supply needs. A study performed by Applied Technologies, Inc., an engineering and architectural firm headquartered in Brookfield, Wisconsin, identified the construction of a new Central WTP as the most cost-effective solution, providing the City with reliable water treatment for at least the next fifty years. The Watertown Historical Society initially questioned the City’s desire to demolish the Central WTP building. However, an archaeologist determined that modifications made to the building throughout the years had reduced its historical value. The Water Department and Historical Society reached a compromise: several historical architectural appurtenances would remain untouched, and the new building’s design would honor the old building: distinctive cream-colored bricks pay homage to the original building, Well No. 1 remains intact, and several historically significant items were saved for curation. 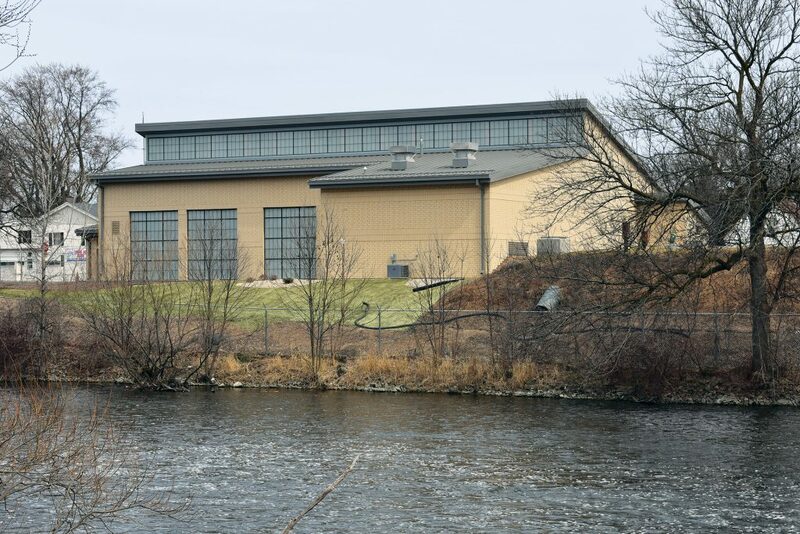 Located in a residential area on the Rock River, the restrictive footprint of the WTP required creative siting and construction of the new facilities. The decision was made to construct a new water maintenance building on the City’s spacious wastewater treatment plant site. The 15,200 square foot pre-engineered metal building was designed to match the existing plant buildings and includes features such as vehicle storage bays, offices, a locker room, and parts storage. The new 8,000 square foot Central WTP filter building was loosely designed to mimic the rooflines of the City’s nearby Senior & Community Center and Parks & Recreation Department. Clerestory-style steel roof trusses were used to provide a unique, modern look. Staging procedures outlined in the Water System Master Plan Update were carefully crafted to ensure continued water treatment during construction. The Central WTP was taken completely offline throughout construction, and water utility operators were able to treat and deliver potable water through use of the City’s remaining storage and treatment capacity. Sustainability was a major consideration throughout the project. The new building conforms to modern building codes to reduce heating and cooling energy use, and redundant pumping operations were eliminated. Translucent clerestory and wall panels provide natural light, reducing the use of artificial light energy. The four translucent wall panels are removable, eliminating the need for building modifications when the filters eventually require replacement. The new plant costs less to operate and maintain than the original plant and produces water with greater iron and manganese removal. Looking to the future while preserving pieces of the past, the City of Watertown is prepared to deliver high quality water to its residents for decades to come! The ACEC WI Engineering Excellence Awards program recognizes and celebrates engineering achievements that demonstrate the highest degree of skill and ingenuity and contribute to the quality of life of Wisconsin citizens. For more information, visitwww.acecwi.org.